What is Off-Page SEO? Off-Page SEO is anything you do to improve the ranking of your website through promotional means. In other words its things that you can do out side of your website. These factors are off-page they are not controlled by you or any coding on your site. To help you understand we should break SEO down into two parts. On-Page SEO and Off-Page SEO. If you look at the below image of a iceburg in the water, think of all the ice above the water as On-Page SEO and all the ice below the water as Off-Page SEO. The above iceburg represents On-Page and off Page SEO. The top of the iceburg that is above the water represents everything you do on your website which we call On-Page SEO. 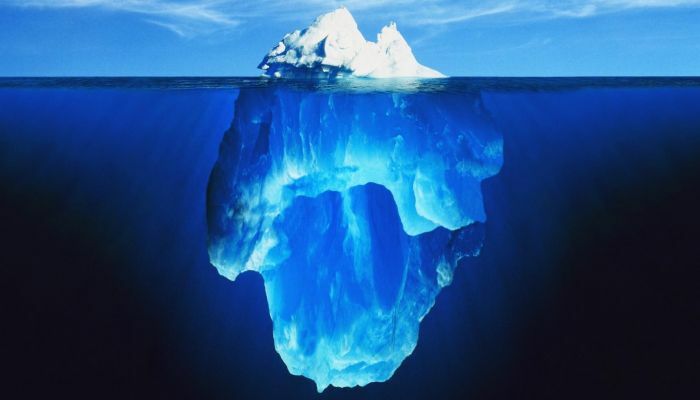 The part of the iceburg thats under water represents the Off-Page SEO. As you can see from the above image just creating a website is not enough if you want to get free traffic from search engines like Google, Yahoo, and Bing. STOP! IF YOU HAVE NOT READ OUR ARTICLE ON-PAGE SEO THEN YOU SHOULD READ THAT FIRST THEN COME BACK TO THIS PAGE CLICK HERE TO READ THE SEO ARTICLE. If you think your On-Page SEO is up to scratch then you need to start your Off-Page SEO. Remember to keep on adding fresh content to your blog. Google and other search engines love content, always add fresh new content on a regular bases. Think about it. Driving organic traffic to your site means that your site will get plenty of FREE visitors. But whats great is that this is not just any visitor. Its someone that is looking for a specific thing. If you manage to get your SEO correct for a certain keyword phrase your site will be in postion one on page one for that search phrase on Google. Our website is about building websites. That means people that want to create a website, make a website, build a website need to find us on search engines like Google. EXAMPLE: Go to Google.com type create a website using easysite. You will see that Easysite holds the first position. When people click on our link it does not cost us anything. Create a website using easysite is one of many keyword phrases that brings in visitors that want to build a website. 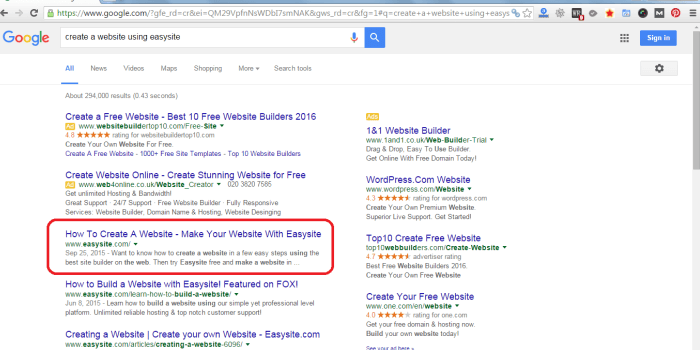 The above picture shows you the natural position of Easysite for the search term "create a website using easysite". You can also use the keyword phrases "make a website using easysite" and "build a website using easysite". We on the first position first page for those keyword phrases and lots more. Having hundreds of keyword phrases on the first page of Google's search results will bring your site lots of free traffic. Lets find out how we can help you get some of this free traffic. Before we look at link building, social media, and social bookmarking I want to explain about the importance and benefits of off-page SEO and why you should do it. Search engines like Google are always looking for ways to return the best results (Website) for the search term typed into their search engine. The way they find the best site for the search phrase used is On-Page SEO and Off-Page SEO. If you would like to find out more on how Googles search works watch the below video by Matt Cutts the former head of the web spam team at Google. He is currently working with the search quality team on search engine optimization issues for Google. Listen to what he says and apply his advice to your On-Page and Off-Page SEO. When you build a website it should have unique good quality tutorials about the topic of the site. If other site owners find it relative and good quality they will link to the site as a reference. People on social media will share and bookmark your page when they see it. All these different links from different websites pointing back to your home page and other pages of your site count as a votes in the search engines eyes. What you are really looking for is backlinks from high authority sites with the same topic as your site. If you want to rank in a certain country then those sites should have the country prefex in their domain. Example if you wanted to get visitors from the United Kingdom you should have a few good authority backlinks from .co.uk domains. Think Of Off-Page SEO as, how the World (other websites and users) see your site. MORE VISITORS - Because your site has increased in rankings you will get more visitors. INCREASE IN AUTHORITY - Your site will increase in authority. The higher the authority the more likely your site will rank higher in search engines for its keywords and keyword phrases. MORE EXPOSURE - The higher your site ranks the more exposure your site gets and that means more link building as people recommend it which means more exposure. Link building is the most popular off-Page SEO method. Some webmasters will build links themselves. Its all about trying to get as many votes (backlinks) pointing back to your site, so that you will have not necessary more, but a higher backlink link authority than your competitors. This will help you rank higher than them. Think about it, if someone reads this article and likes it they may place a link on their website to this page. This is a vote. Its like they are telling search engines this page has good information. So writting good articles is a must to improve your Off-Page SEO. You get the benefit of someone linking back to your article from their site which improves your Off-Page SEO and you could even get visitors from the link in the article. Since webmasters found out their sites would rank higher in search engines when other sites linked to their site they have been trying to build links to their websites. They invented a number of ways to increase backlinks that pointed to their website. SOCIAL NETWORKS - Sign up to social networks like Facebook, Twitter, Google Plus, Linkedin, Tumblr and all the rest. Sign in to your different social accounts at least once a week and post your sites link. Include social share buttons on each page of your site, visitors that like whats on your page will share the page on their social networks. It should be noted that almost all of the links you get from social media sites are "nofollow" but this does not mean that they do not have any value. Social Media mentions are gaining ground as ranking factors and proper configuration of social media profiles can also boost SEO. BLOG DIRECTORIES - You can have a link back to your site from blog directories. Below are some examples of high authority blog directories. FORUM SIGNATURES - When you sign up to a forum you can normally have a link in the signature. Make a few comments and get a link back to your site. Below are some examples of high authority forums. LINKS ON COMMENTS - Search for sites with the same topic as your site that you can leave a comment on. Read the article and make a comment about the article. Remember the site owner has to approve the comment so make sure its about the article. Most times you will use your name not a keyword. Use different names. These links are normally no-follow. ARTICLE DIRECTORIES - Publish articles on an article directory. Write your own short article include a link and publish it on an article. Some article directories accepted only unique content. Below are some article directories examples. GUEST POSTS - A lot of site owners want content for their sites. Some of those site owners offer guest posts, this is where visitors can submit a guest post with a relative topic and include one link in the content. They insist that the article must be a certain amount of words, no grammer errors, well written and unique. This is another way that some webmasters get backlinks. BACKLINKS - A lot of webmasters used to buy backlinks, some still do, but this is scary. Be very wary where you buy backlinks from they can damage your site. Rather create good content, thats interesting and other site owners will link to it naturally. SUMMARY - The more competition for the keyword phrase the harder you have to work to beat the competition. Your Off-Page SEO must be a natural process, with a mixture of keyword phrases, non keywords and different versions of your sites URL in the anchor text of backlinks on other sites. Example: Some of our anchor text keyword phrases for Easysite Home page below. Note: The home page URL is included in anchor text a few different ways. The important part of the above anchor text is to get the correct percentage of each keyword phrase you want to rank for right, and the sites linking to your site have to be of high authority. Check the percentage of the different anchor text backlinks of your site on https://majestic.com.